Cooler Master today announced a high-end case with silence in mind, but did not neglect the needs of a powerful system in the Silencio 650. Silencio 650 has a rich I/O panel what includes a DualBoot HDD switch allowing you to have control over booting between two separate operating systems (ex: Windows and Mac). This can be done by simply sliding the switch! The I/O panel also features: a fan controller for up to 6 fans that work at 700 or 1200RPM, memory card reader and super speed USB 3.0 ports that double as rapid charging ports for smartphones and tablets with roughly 1A of power. On the inside, it has a layer of noise dampening foam, hot swap X-dock, enough room for up to 8 HDDs and up to 3 high-end graphics cards. Cooler Master Silencio 650 is built upon a design to mitigate the sound generated by noisy system components. This is achieved through a seemingly simplistic design with the diamond-cut aluminum front panel, concealable air ducts and a fan control that supports up to 6 fans. On the inside, there is a layer of sound absorbing foam to lessen the operating noise. Silencio 650 supports a total of 7 + 1 expansion slots that allows you to setup a 3-way SLI or CrossFireX, with the option to house ultra-long high-end graphics cards of up to 434.0mm / 17.1” (after removing the upper HDD cage). 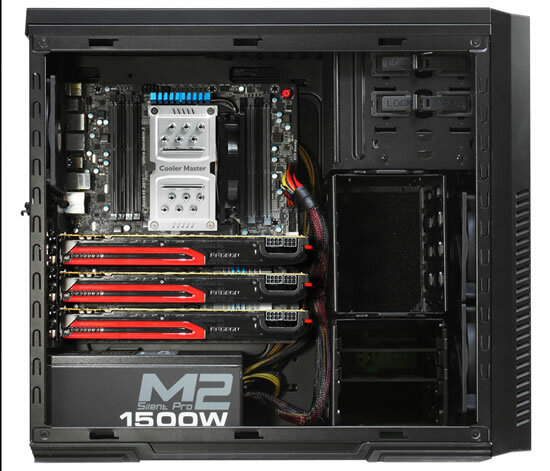 In addition, the 3.5”/2.5” Hot swappable X-Dock and seven HDD bays provide plenty of storage expansion.